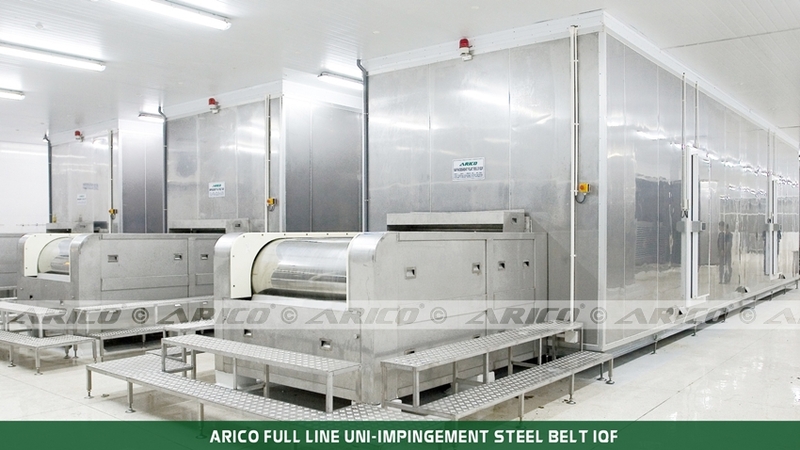 Arico’s Uni-Impingement Steel Belt IQF is a straight freezer using stainless steel flat belt that satisfies hygiene standard requirements and is easy to clean. 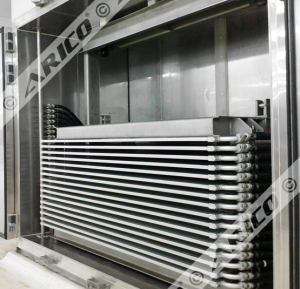 With “Uni-impingement” effect that controlled the cold jets airflow in combination with high thermal conductivity stainless steel metal belts to ensure the highest rate of heat transfers on both side of the freezing products. 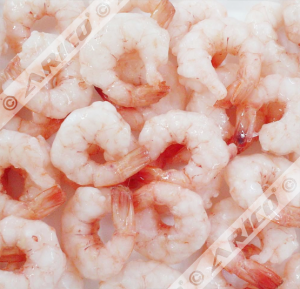 Perfect appearance with non-sticking and no mesh marks on final frozen products. 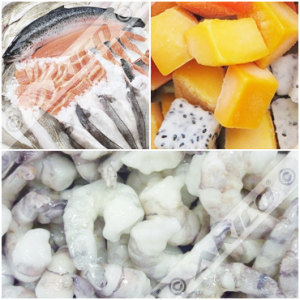 Well suited for fish fillet, scallop, sensitive products. Customizable on each Uni-Impingement Stainless Steel Flat Belt IQF according to customers request. 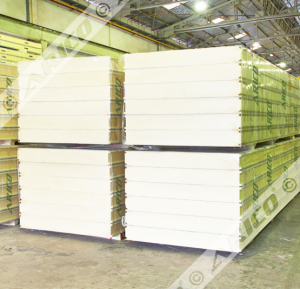 Uni-Impingement Steel Belt IQF is designed for continuous high production with 1 or 2 straight belts which are synchronously or independently belt speed controlled. 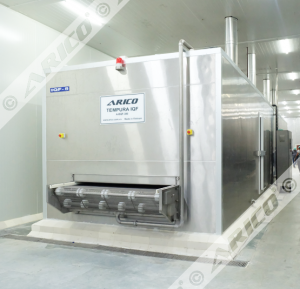 As the food demand is going up day by day, the Food processors always require a high productive freezer that is not only able to considerably increase their productiveness, but also remarkably reduce the CPU (Cost Per Unit) and OMC (Operation and Maintenance Cost). Uni-Impingement Steel Belt IQF is not standing out of this trend, with designed freezing capacity up to 3000 KG/HR and AAD system (Automatic Air Defrost) along with CIP (Clean in Place), it provides more than 24 hours non-stop operating and reduces the defrosting and cleaning time a half compares to conventional IQF. Uni-Impingement Steel Belt IQF is designed with fully stainless steel and food grade materials enclosure; full-welded floor and sturdy structure. 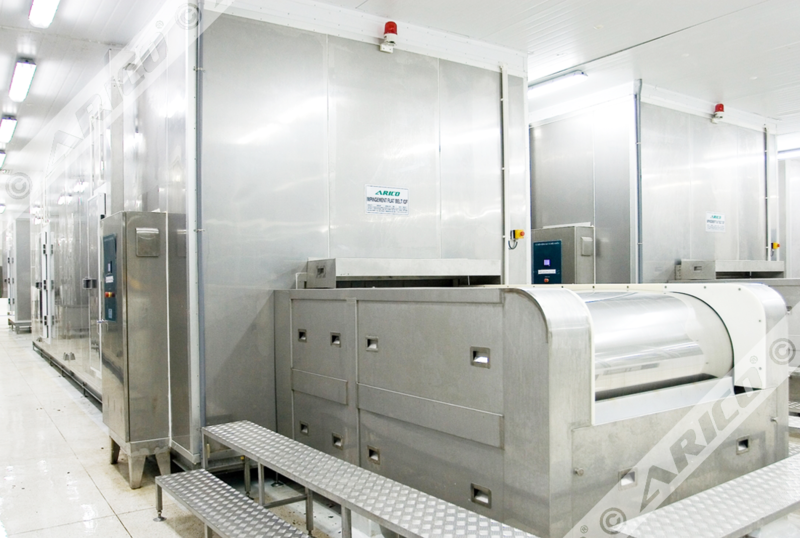 Not only that, but also, the “Access everywhere” and “Easy to Clean” design criteria are immersed into Uni-Impingement IQF, thus ensure our Quality and Hygiene Policy. Nowadays, Go Green is our motto that leads us to be more responsible to the world we live. 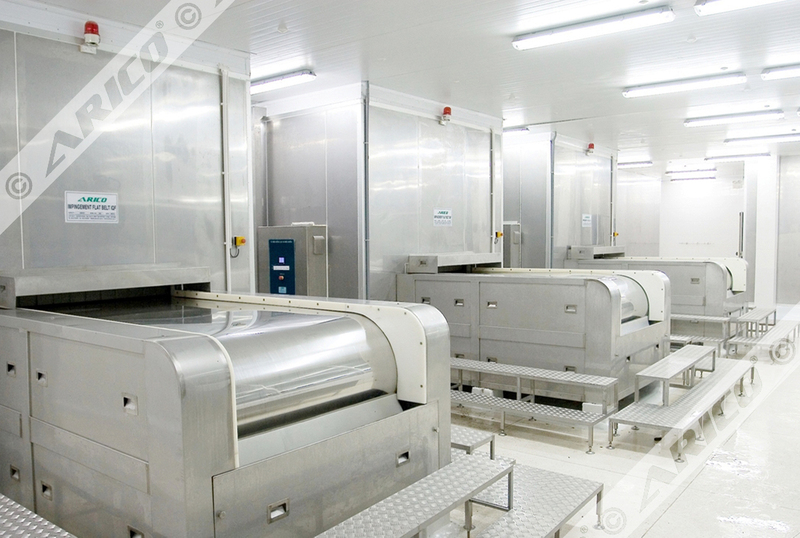 With the help from powerful computers, we calculate and optimize the air flow; design the sturdy structure that reduces the pressure drop, eliminates the vortex, and decrease the air loss; improve the refrigerant distribution in the evaporator; then resulting a Unique Impingement Steel Belt IQF with less power required for fans and less refrigeration capacity requirement from the system. Technically, the Uni-Impingement IQF is design in standard modules that help shortening designing and manufacturing steps. 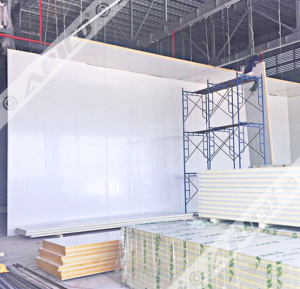 The assembling and dry testing process are also effortless and takes less time than ever before. 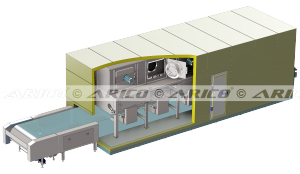 Furthermore, the modular design make Capacity Expandability become possible by assembling additional modules to the Uni-Impingement Steel Belt IQF. 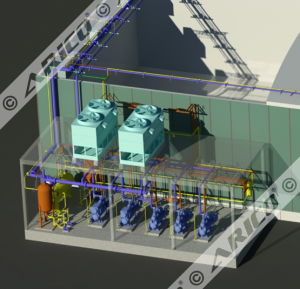 As a Design and Build Contractor, our designs are flexible to every customer’s need. Out of standard modular design, we also offer a customized Uni-Impingement Steel Belt IQF that meets your requirement and condition. If you have any problem, please leave it to us. 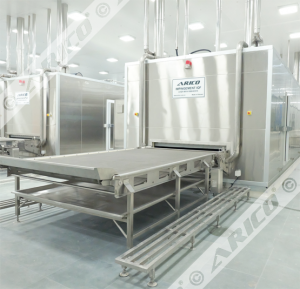 Arico’s Impingement Steel Belt IQF has been designed to combine the best features of the high conductivity stainless steel flat belt and impingement freezer to ensure hygienic and fast freezing for sensitive products. 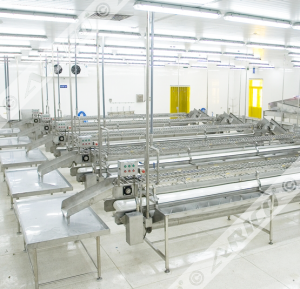 Products are conveyed by stainless steel flat belt through the impingement zone. 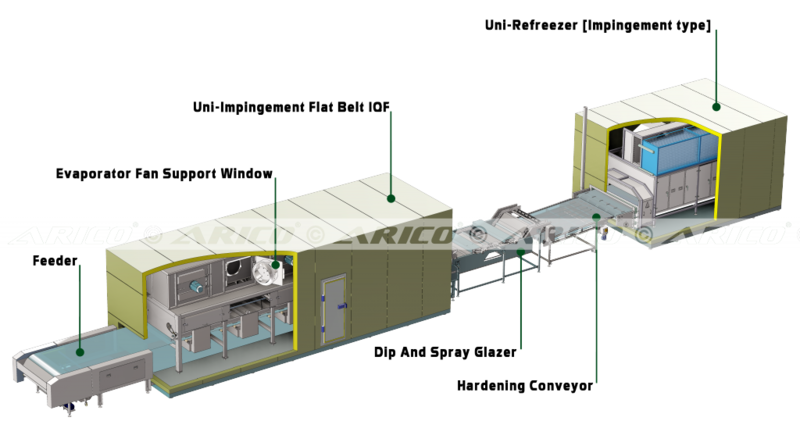 Thousands of high velocity cold jets airflow via air nozzles are directed to upper surface of the products together with the bottom of the steel belt simultaneously. 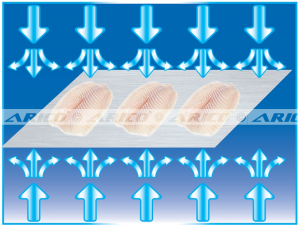 The top jets airflow continuously interrupts the boundary layer that surrounds the products, enhancing the surface heat transfer rate. 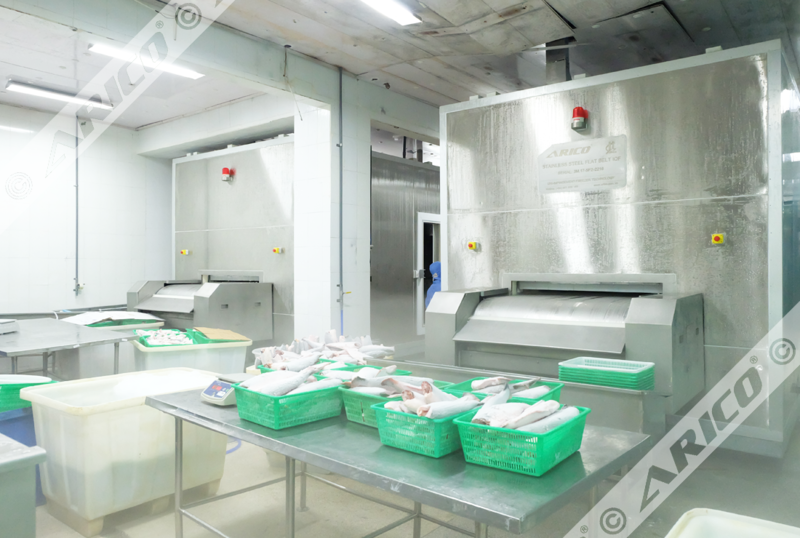 From the bottom side, not only the conductivity of the stainless steel belt allows some heat to be removed from the products by contact, but also convection is more efficient. 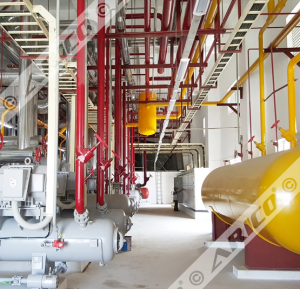 Thank to concurrent heat exchanging on all surfaces of the products thus freezing process is fast and mesh marks free for final sensitive product. Special deign for sticky and shape-sensitive products. 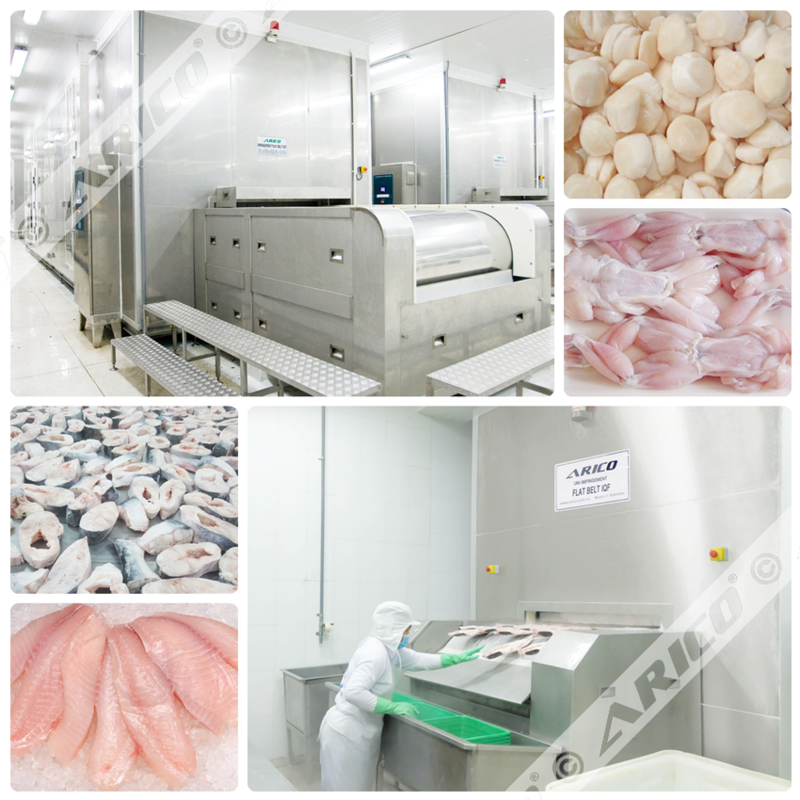 Only Stainless Steel and Food Grade Materials are used to make Uni-Impingement Mesh Belt IQF. Maximum yield, minimum dehydration, no deformation. 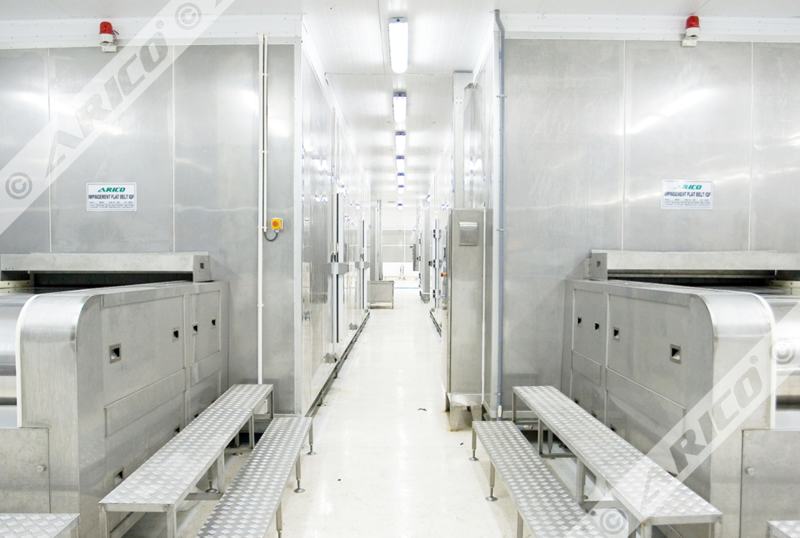 Access doors and two full height access walkways in both sides make Uni-Impingement IQF become Access Everywhere, Easy to Clean. 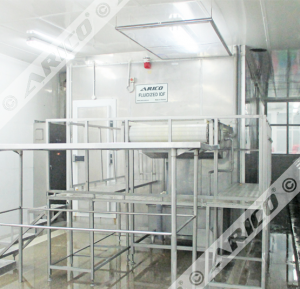 Operator can easily access to fans and coils (to clean or do maintenance) position without any difficulty. Optimized air flow, sturdy and aerodynamic structure, aluminum aero foil blade profile evaporator fans allow less power consumption. Air Defrost System is integrated help saving water for cleaning and prevent frost forming on belt surface. WSFC (Water Sterilizing, Filtering and Circulating system) is available as an upgrade option make saving water is even more efficient. 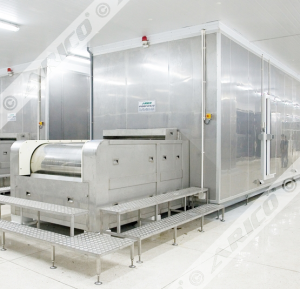 Ease and friendly Industrial Control System is built for food processing environment with high stability and precision. 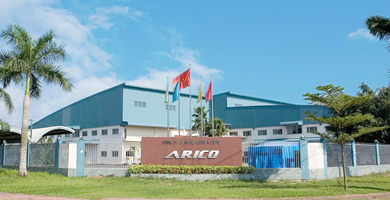 It is ready to connect to all industrial communication networks in a modern SCADA system.